The eternity that seemed to be the winter of 2012-13 seems to be finally over. Be inspired by the colours returning to your garden. After what has seemed to be the longest winter in eternity and a frankly miserable spring, summer has finally arrived and we can’t wait to start soaking up the sunshine. As the days become that little bit brighter and the days a little bit longer, our moods lift and we start to embrace more vibrant colours, and let the sunshine into our homes. When selecting your chosen shade, why not look to nature for inspiration; step outside into your garden and look at the colours on offer in your flowerbed – could these work in your home? 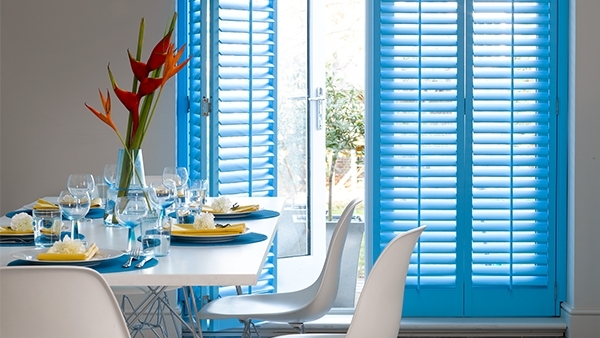 Whilst blue can sometimes be cold, the bright sky blue of the shutters pictured above reflects that of a sunny, summer sky, and perfectly complements this modern, fresh scheme.With all that sunlight, however, comes the need to keep our homes that little bit cooler during the day. Shutters are of course the perfect solution to this problem; if you open the slats of your louvered style shutters, not only will air be allowed to circulate through the room, but they’ll also block out the rays – avoiding that dreaded greenhouse effect in your home!